As the fashionable world was largely composed of those connected with either the House of Lords or the House of Commons, their families came up to Town around the second week of February, after the best of the hunting was over. The Queen (and after his ascension, King Edward) then opened Parliament. Prior to this was the “little season,” wherein those connected with the government, the diplomatic corps, the lawyers, literary people and those of the gentry who had no large estates, remained in Town from November, with an interval of a fortnight at Christmas, until February. This was a more intimate gathering of society and was seen as the prelude to being accepted into the social round the following year. At the beginning of the year, London was not yet overcrowded as many families chose to remain in the country, but from February until Easter, the city slowly filled. There were a few dances during Lent, and small dinners and the occasional theatre party were held. Many of the royal levees and drawing rooms were attended, and other evening entertainments were thrown together,while daytime hours were spent in numerous five o’clock teas. 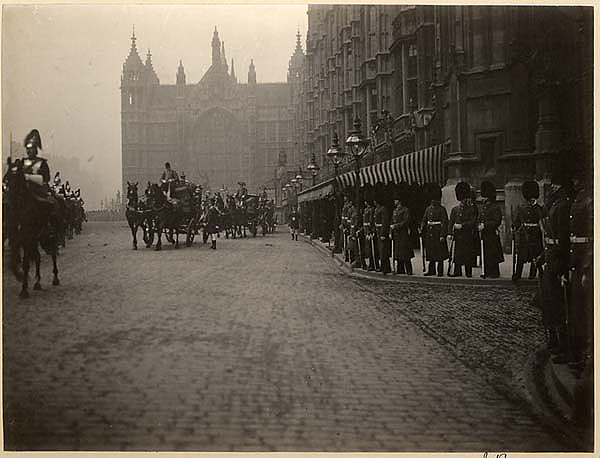 When Parliament adjourned at Easter, society hostesses held large country-house parties, while those who had neither country houses nor invitations took a jaunt to the Continent or went to Brighton. After Easter the full tide set in, everybody was up. The great houses were opened, the Park filled in the afternoon, and the Row crowded every morning with a thousand horsewomen. Lunches were frequent, dinners innumerable (forty people often sat to one sumptuous board), and balls now began. The Queen’s drawing rooms were crowded, and most theatres and operas were abandoned by people of fashion as it was impossible dine at eight and attend a play on the same night. However, this whirl lasted but five weeks when another Parliamentary recess was called and society flit again to the country at Whitsuntide (Pentecost to Americans). 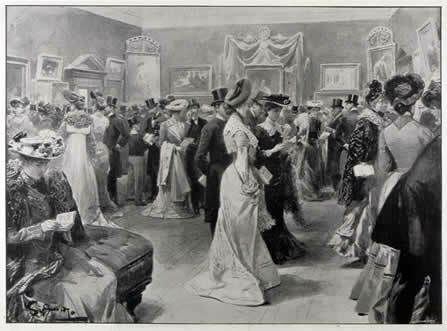 Society returned to London in late May and the traditional starting signal for the Season was the Private View at the Royal Academy, or, vernissage, where the latest frocks could be seen as ladies and gentlemen strolled about examining works of art and discussing them with their artists. From this point on was the height of the season. 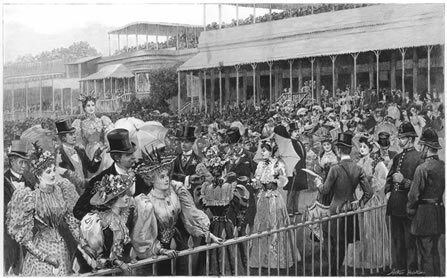 With late dinners and later balls, visits to old friends and acquaintances, the Sunday Church Parade at Hyde Park (another event in which to see and be seen), attendances at Covent Garden, charity bazaars, and young ladies and new wives of qualified gentlemen making their curtseys in Court Drawing Rooms, days and nights were packed to the brim. 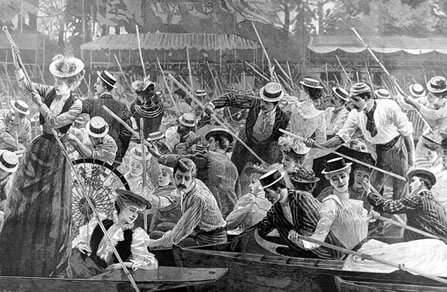 With June came Derby day, Commencement at Eton (4th of June: families visit the boys for speeches and a boat race), Ascot Week, fête and gymkhana at the Ranelagh Club. July featured the major cricket matches between the Lords and the Commons, Oxford and Cambridge, and Eton and Harrow, at Lord’s–all in one week. Garden parties in bungalows and snug cottages along the Thames were held–Chiswick, owned by the Duke of Devonshire, was loaned to the Prince of Wales on the condition that two large breakfast parties were held each week. The Queen opened the grounds of Buckingham Palace for garden parties as well, a trend that lasts into this day. The Duke of Richmond’s race-meeting at Goodwood, the Henley Regatta, Cowes Week and Wimbledon, the last of the fêtes champêtres, were packed into the first weeks of August, and as London began to empty, dinners, parties and the like were crammed in before it emptied completely. August 12th, otherwise known as the Glorious Twelfth, was the end of the London season, and those who didn’t hare off to shoot grouse or stalk deer in Scotland and the North usually traipsed across the Channel for cures at the numerous Continental spas, leaving Britain once more to the sporting set. Thank you for your informative article on the London Season. I am using it as a source of information with a group of adult education students. I have, of course, credited your website. I’m glad to have been of service! lol, does the post cover all you need to know? Hmm, now I can’t quite remember why I decided to look up the Season. But I’ve found The Social Calendar quite useful, especially as it gives the social happenstance in 1897 and my WIP is in 1897! And am looking forward to reading the other two books as well. I really enjoyed this article, and am interested in the three books mentioned for further reading, but they are way out of my price range. I’ve checked our local library, but those titles aren’t in stock. Are there any other books or websites that you could suggest with similar information? I’m reading purely for curiosity, so I really can’t spend a fortune. Yes! The books I listed are quite pricey and while I am fortunate that my interlibrary loan carried them (have you checked to see if your library system had ILL? ), I did eventually buckle down after a zillion check-outs and paid about $20-30 for each since I do utilize them extensively (I write historical romance). I don’t think I could recommend any other books or websites since the reason why I count them a bargain are because they are so thorough and detailed on a subject most social history books are very vague about or ignore (lumping it all into the Victorian era, or because of the Jane Austen craze, focusing only on the Regency era). What I can do is create specific posts focusing on the contents of the book. I don’t believe our library system has ILL. (I haven’t heard of it before, and I can’t find anything on their website.) I have a few more places in town to check, but I might just decide to order the books eventually anyway. I understand your need to use them since you write historical romance – I want to learn more because I read historical romance! Most authors give enough information to really get a clear picture of what life is really like for the characters, but I am still curious about so many things! I would be very interested in any posts in which you focus on these books. Thanks for your response! I have become more and more interested in the leisure time activities of the late Victorian and the Edwardian eras, be they parks and gardens, beach pavilions, beach huts or pleasure piers. The London Season in general, and the Sunday Church Parade in particular, are splendid concepts that I will come back to again and again.